Description: The present volume undertakes a systematic study of the ancient texts testifying to St Peter's time in Rome. It evaluates inter alia texts by Early Christian Church teachers (Justin Martyr, Dionys of Corinth, Irenaeus of Lyons), the letters by Ignatius of Antioch - classified as unauthentic - and the legends surrounding the Apostle recounting Peter's encounter with Simon Magus and Nero's persecution of the Christians. The analysis includes a detailed examination of the dating of the First Epistle of Clement and the late New Testament writings. The analyses are complemented by a critical edition (with commentary) of the martyrdom accounts using new manuscript sources. 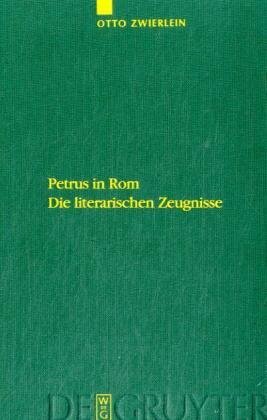 Citation: James D. G. Dunn, review of Otto Zwierlein, Petrus in Rom: Die literarischen Zeugnisse, Review of Biblical Literature [http://www.bookreviews.org] (2010).